With their large pincers and venomous, stinging tails, scorpions can be intimidating creatures. While these arachnids generally keep to themselves in the wild, they won't hesitate to fight off attackers and hunt food using one of their natural defenses. Scorpions have a few weaknesses that may leave them vulnerable, but they generally compensate with these self-protecting mechanisms. At the scorpion's front end, he's equipped with two large pincers, also known as pedipalps. Unlike snapping jaws, these pincers are actually sensitive, and can even be used to hold onto a partner during mating. As a defense mechanism, however, these pincers are invaluably strong. In fact, a scorpion's pincers are sometimes so strong that he doesn't even need to use his stinging tail to subdue a foe -- he simply crushes him. If his pincers aren't strong enough to finish the job, he uses them to hold his opponent in place while he brings down his tail. Scorpions are easily recognizable by their large, articulated tails with the stingers on the end. 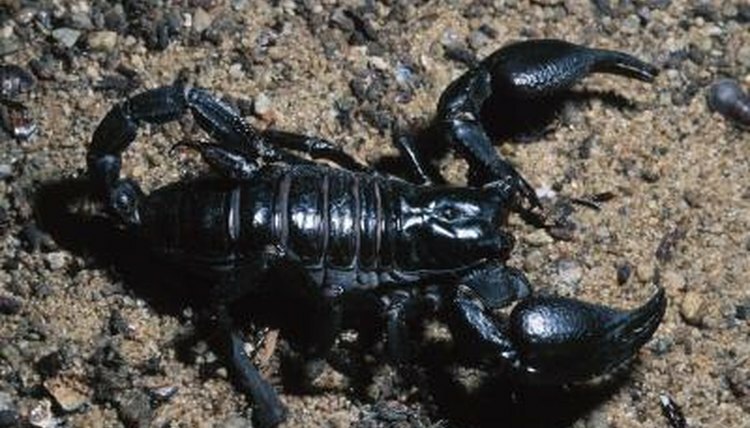 A scorpion sometimes uses his tail to sting his prey, injecting it with toxic venom. Because their venom requires a lot of energy to replenish, they generally only resort to using the stinger when they know that they have to -- venom can be strong enough to protect a scorpion from predators as big as owls and coyotes. Some scorpions actually produce two types of venom -- one that's lethal, and one that only stuns prey. In those cases, lethal venom is usually reserved for prey, while stunning venom is used for self-defense. Scorpions are typically nocturnal hunters, and they keep to themselves. Solitary arachnids, these creatures either actively hunt their prey or lie in wait, hidden from sight, until an unsuspecting victim wanders past. Despite their arguably fearsome looks, scorpions aren't generally aggressive or vicious creatures. While they aren't afraid to defend themselves, they only hunt and eat once or twice a month. While his pincers and stingers are powerful tools for self-protection, a scorpion is far from the ideal warrior. For example, one of the reasons these creatures are nocturnal is that their eyesight is so poor. Their eyes are typically only good in the dark, where they can detect light and motion, but otherwise they rely on feeling their way around their environment.